Eat broccoli sprouts to prevent bladder cancer . . . Eat more blueberries to reduce your risk of colon cancer . . . It seems that every day we hear new discoveries about various foods' anti-cancer properties. But the information comes in little bits, from all different directions, and it's hard to know how to put all this information to use in your own diet to reduce your risk of getting cancer. 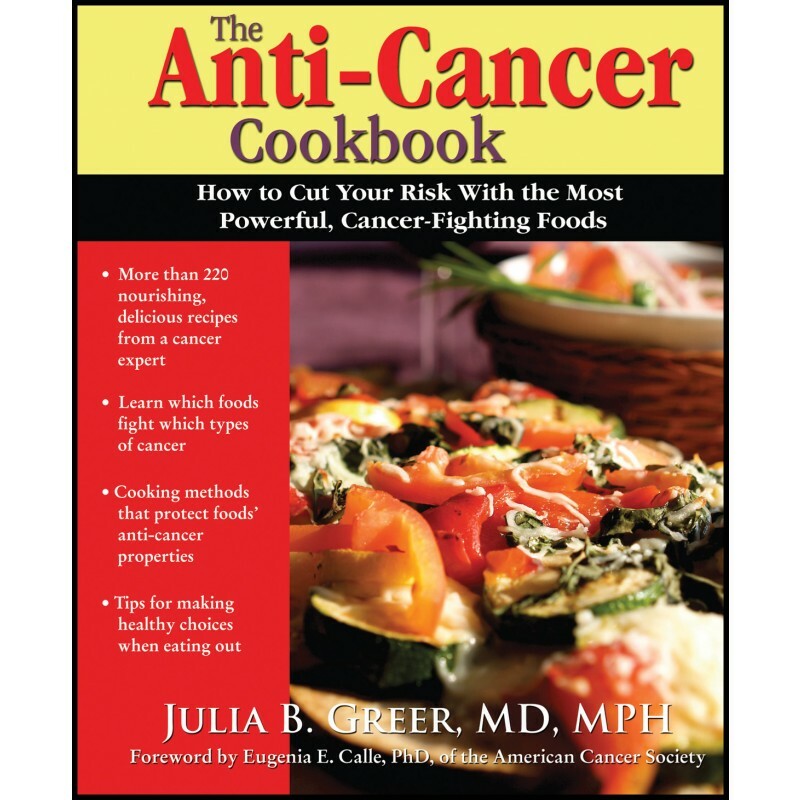 Now, Dr. Julia Greer - a physician, cancer researcher, and food enthusiast - pulls together everything you need to know about anti-cancer foods into one handy book: The Anti-Cancer Cookbook. She explains what cancer is and how antioxidants work to prevent pre-cancerous mutations in your body's cells, and then describes in detail which foods have been scientifically shown to help prevent which types of cancer. She then shares her collection of more than 250 scrumptious recipes for soups, sauces, main courses, vegetarian dishes, sandwiches, breads, desserts, and beverages, all loaded with nutritious ingredients chock-full of powerful antioxidants that may significantly slash your risk of a broad range of cancer types, including lung, colon, breast, prostate, pancreatic, bladder, stomach, leukemia, and others. Dr. Greer even includes tips on how to cook foods to protect their valuable antioxidants and nutrients and how to make healthy anti-cancer choices when eating out. If you love good food and are looking for delicious ways to keep yourself and your family healthy and cancer-free, you'll find yourself reaching for The Anti-Cancer Cookbook time and time again. Julia B. Greer, MD, MPH, is an assistant professor of medicine in the Division of Gastroenterology, Hepatology and Nutrition at the University of Pittsburgh School of Medicine. She was educated at Phillips Exeter Academy, Princeton University, Mount Sinai School of Medicine, and the Graduate School of Public Health at the University of Pittsburgh. She completed a National Cancer Institute-sponsored fellowship in cancer epidemiology and prevention, as well as a National Institutes of Health-funded research training fellowship in high-risk genetics. She holds a master's degree in cancer epidemiology. She has published numerous articles and book chapters on ovarian, breast, and pancreatic cancer, as well as on the effects of obesity, alcohol, and cigarette smoking on cancer and other types of diseases. She serves as a director for the required medical school course "Digestion and Nutrition" and for the elective course "Nutrition and Medicine" at the University of Pittsburgh School of Medicine. She is a lifelong foodie and exercise enthusiast who has given dozens of talks on nutrition and health. And she makes one mean banana bread.